Today we pay tribute to one of the twentieth century’s most potent symbols of courage and fortitude, the legendary Helen Keller. Rendered deaf and blind at nineteen months as a result of what was probably scarlet fever, the extraordinary story of her extraordinary communication breakthrough at the age of seven – with the help of her teacher Anne Sullivan – catapulted Helen to international fame. The “wa-wa-water” moment – re-enacted time and time again in motion pictures, plays, dramatisations and storybooks – is as iconic to American schoolchildren as George Washington chopping down the cherry tree. Defying her disabilities, Helen went on to graduate from Radcliffe, America’s most prestigious university for women, becoming the first deaf-blind person to earn a Bachelor of Arts degree. A gifted and prolific writer, she authored twelve books and numerous articles and essays for national papers and literary journals. And, as a world ambassador for the American Federation for the Blind, no one did more to raise awareness of the plight of others with disabilities. A recipient of the Presidential Medal of Freedom, elected to the National Women’s Hall of Fame, her image honoured on a postage stamp and the Alabama state quarter, Helen Keller is an unmitigated American Folk Hero. But what the endless accolades and history books almost always fail to mention is that Helen Keller was a militant radical activist. Her views mirrored the likes of the era’s most notorious dissidents – Emma Goldman and Eugene Debs – who were respectively deported and imprisoned for ten years. “I don’t give a damn about semi-radicals,” she famously proclaimed; indeed, she leaned so far to the left that the FBI kept a file on her for un-American activities. She was co-founder of the American Civil Liberties Union; a lifelong socialist who campaigned for Eugene Debs’ presidential candidacy; a member of the revolutionary Industrial Workers of the World; a suffragist and crusader for birth control; an anti-fascist (the Nazis publicly burned her books); and a pacifist, who condemned America’s imperialistic motives in both world wars. Having benefited from a privileged background, Helen recognised the social injustices facing those denied the same opportunities – and blamed industrialism and capitalism as the root of poverty and disability-inducing diseases. Her anti-capitalist and pro-worker stance was such that at the 1919 Hollywood premiere of a silent film about her own life, she refused to cross an Actors Equity Union picket line. Instead, she joined the striking workers on their march. Yes, she overcame unimaginable odds to break through from the darkness, and her story will rightly continue to awe and inspire future generations. 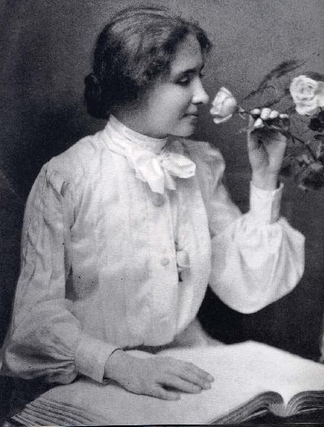 But the neutralisation of Helen Keller’s beliefs belies an equally important aspect to her legacy: she heard things that most close their ears to, and saw things that most turn a blind eye to. This entry was posted in Heroines. Bookmark the permalink. I really am a HUGE fan of your blog. So much so, that I’d love to have you over for tea! Ah the discussions we’d have! You are brilliant! Thanks very much for your contributions, and please, keep up your good work! Fantastic blog! What a great thing you are doing! You are to be applauded for such a culturally important site! In Tuscumbia Alabama where her birthplace, a museum, is located, there is a big festival in her honor held every year. There is a performance of “The Miracle Worker” play depicting her early childhood and the amazing work with her by Anne Sullivan.The play culminates in her ability to articulate the word “water”.. It is a very moving and inspiring story. However,there is never any mention of Keller’s radical beliefs that she developed, wrote, and spoke about later. There is no telling what would happen if anyone were to attempt to educate the locals as to Keller’s activism in her adult life, and what she really had to say, but someone really should do it. Can we start an online petition to support the additional important social activist information in the annual celebrations? I don’t know how to do it myself but her true and whole story needs to be as widely known as her amazing life of overcoming adversity. I never knew this awesome aspect about Helen’s and as usual am extremely grateful for this website for educating us about the lives of inspiring people. Thanks OTD!